The JEE Main Physics Gravitation is Very helpful for all students. Now Scroll down below n click on “Start Quiz” or “Start Test” and Test yourself. Figure shows the variation of energy with the orbit radius r of a satellite in a circular motion. Mark the correct statement. ∴ A is kinetic energy, B is potential energy and C is total energy of the satellite. Moon is revolving around earth in almost circular orbit. Sun exerts gravitational pull on both, earth and moon. When observed from sun, the orbit of the moon will not be strictly elliptical because they total gravitational force (i.e., force due to earth on moon and force due to sun on moon) is not central. The ratio of period of revolution S1 & S2 is 1 : 4. Centre point is the unstable equilibrium position where potential energy is maximum. Since the gravitational field is conservative field hence, the work done in taking a particle from one point to another in a gravitational field is path independent. Net gravitational field inside a shell is zero. Hence, net force on the particle will be zero i.e., the particle stays at rest in its original position. T2 = 8 × 4 = 32 hours. 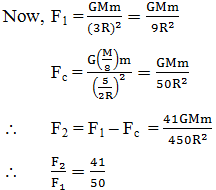 A particle of mass M is at a distance a from the surface of a thin spherical shell of equal mass and having radius a. Potential at centre is non zero due to both shell and particle. A satellite orbits the earth at a height of 400 km above the surface. How much energy must be expended to rocket the satellite out of the earth’s gravitational influence? Mass of the satellite = 200 kg, mass of the earth = 6.0 × 1024 kg, radius of the earth = 6.4 × 106 m, G = 6.67 × 10-11 N-m2/kg2. Energy required send a satellite out of earth’s gravitational influence is called its binding energy. Therefore, from A to surface v and hence the potential energy will decrease. Inside the shell potential is constant. Hence, the potential energy is constant. Hence. The minimum amount of energy that is added so that it escapes the earth’s gravitational field is Ek. Assertion From a solid sphere of radius R, a hole of radius R/2 is cut as shown in figure. To find the magnitude of gravitational potential and gravitational field strength at O, we can directly subtract Potential due to hole (before removing) from potential due to whole sphere (before removing). The same can be done to find field strength at O, although potential is a scalar quantity and field strength is a vector quantity. Reason In gravity, it is done like this. It makes no difference, whether the field strength is added/subtracted by vector method or by scalar method. Assertion A planet may orbit around a star either in orbit P or orbit Q. The speed of planet at O is same for both orbits. Reason Planets orbit around a star with uniform velocity. In circular path, star should lie at centre.